“It was exciting reading fiction and nonfiction from the different writers about Uganda’s independence after fifty years. I saw Uganda in different perspective, culture and love for Uganda. The judging process gave me insight to huge talent we have in Uganda. The future is bright for Ugandan writers and we need opportunities to showcases our hidden talents. 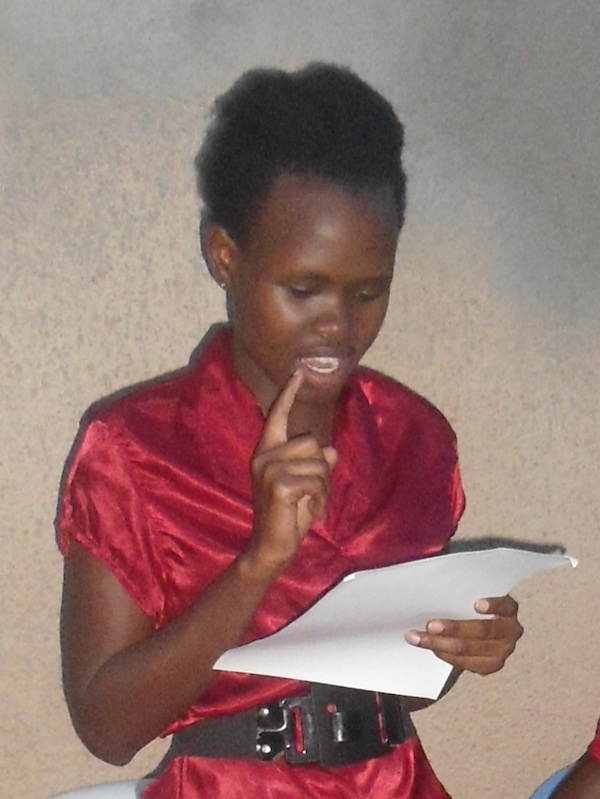 I am glad that many people took this seriously and came up with beautiful writing.” – Beatrice Lamwaka, judge. A short story written by Kaigo Betty, the 2nd runner-up of Femrite @50 writing competition 2012. This date is significant to most Ugandans as the day they received independence from the British. It is important to me too for two reasons; it is the day I was born and the day my mother died while giving birth to me in a grass thatched hut deep down in Eastern Uganda. She was buried thirty feet from the main house. Her grave is still there and it is unfortunately the only image I have of my mother. There are no photos of her. That day my father told me as Uganda was getting independence we were morning your mother. That is why we named you Mbulamuko. Since your mother had died without giving birth to any girl you wouldn’t have any in-laws. So I did go through life-like a solitary being feeling alienated from everyone else. I was four years old, my father had been transferred to Kampala from Kamonkoli College. He had been a teacher of English language there for six years. That is where he met my mother. They met when he was teaching her in form two. When she got pregnant with me she decided to leave school and get married to my father. My father did not want to leave Kamonkoli because of the memories he had there and also because he was still mourning the only love of his life. My father had sworn to himself to be both a mother and father to me so he did not leave me behind on 29/05/1966 when he relocated to Kampala. He got a room in Nankulabye. About two days after our arrival there was uproar. I was playing in the rain that day when a truck carrying men wearing the same type of cloth swung into view. They fascinated me. They went about shouting orders and carrying long pointed sticks. One of the men in the green cloth pointed the stick at a man. He did something to the stick which produced a stone that hit the man on his forehead. The man started bleeding and fell down. In that same moment my father came and gripped me off the ground. He took me inside the house and shut the door tightly. I started crying that I wanted to go out and ask the man in green to show me how he used his stick so that I could do the same when shooting birds back in Kamonkoli. He hit me. I was shocked to feel the sting of his slap resound through my ears. I stared at him while tear drops from my eyes gradually socked my shorts. The following day he tried to explain to me what had happened. He said something about Mengo, the president and soldiers. I was studying at East Kololo Primary school. This is where I met my friend Patel. He was a son of one of the Indian traders who owned a shop on Kampala road. He always wanted to share his breakfast with me but I could not swallow it; it was too hot. One day Patel came to school quite pale. He said that his family was going to Canada. The president had ordered them out. He even told me to listen to radio for confirmation. When I went back home I asked my father to let me listen to the evening news. There was a count down on Radio Uganda — 30 day for the Asians to leave Uganda. Before the 30 days went by Patel had left school. My father had got a business — he owned one of the shops on Kampala Road. I used to walk from Nankulabye to Kololo because transport was less abundant than it is today. Also because I could not afford it, however since my father became an owner of a shop our economic status changed and we moved to Kololo. I used to study with the president’s son. I remember one day I was one of the young boys who witnessed the president come down upon his own son with heavy beating and swearing. The president had been summoned by the school administration because his son had been caught stealing. When the teachers restrained him, because he was almost killing the boy, he protested saying that he does not groom thieves in his home. I completed primary and I was called by Kings College Buddo due to my outstanding performance. But during my last years in primary my father had rediscovered his manhood. In two years he had had about five girlfriends. He never settled with any of them. Changed every now and then until the late 1980s when the NRA took power. I wanted to have a girlfriend just like the other boys in my class but being aware of the circumstances under which I was born I feared that she would suffer the same fate as my mother and so I shunned girls. As a remedy to my dilemma I decided not to have permanent girlfriends just as I saw my father was doing. It was hard to mess around since we were always under the watch of the school. So I think in a way this strictness saved me from self-destruction. I met Gloria. We met at a debate which was arranged for Buddo and Gayaza. We had our share of experimentations and doubts before we decided to formalize our relationship. This was possible because we both joined Makerere University in 1981. Four years later my worst fear were to be resurrected. Gloria was killed. It happened in Luwero in 1985 during the Bush war. She had gone to see her aunt who lived near Luwero town. Some soldiers run into her aunt’s house and as their pursuers tried to force them out they shot Gloria in the chest. She died on spot. Calm returned to the country and I can say that by 1990 the death of Gloria had become a painful distant memory. I got a new mother. She was from a different tribe from us. Our people back home were totally opposed to it since no one had married outside our tribe before, but my father persisted and he had two daughters with her. This sort of pleased our people since there were no boys. I knew my father to have other women. He used to frequent the Gardenia which was a pick up spot, but I never confronted him. I respected him too much to ever question him about his private life. In 1993 my father started falling sick often. I had studied Agriculture at Makerere and I was now working with the Ministry of Agriculture at that time, but I decided to leave my job at the ministry to help my sick father. I wanted to stick with him because he had also done his best to look after me. When my father could no longer manage his business I took over. He became worse. The doctors at Mulago diagnosed him with TB but despite the drugs he took he never recovered. When he started developing skin rushes his wife left him. She took my two sisters with her and I have never heard from them again. My father died a year later. My clansmen were sure he was cursed by his own father because he had abandoned him to suffer in the village after he had fought so hard to make him a teacher. I had started to believe postmortem analysis by my clansmen until I realized through the life and death of Phillip Lutaya that my father like many Ugandans during that time had been a victim of AIDS. I was totally orphaned now but not in the same situation like countless children who had to go to the streets or seek shelter with helpless grandmothers. In 2002 I got married to Sandra. She is ten years younger than me. We met at one of Chameleon’s concerts. Attending such things is one of the ways I keep a youthful spirit. Today at 50 years of age I have two children who wished me a happy birthday, my wife took me to Serena and paid the bill. What evolution our society has taken! My people did not oppose my marriage to Sandra even when she is not from my tribe. As my daughters were singing for me I was watching UBC. There was a broadcast of the Independence celebrations at Kololo and could not help the nostalgic feeling that filled me. A lot has changed; there are more buildings in Kampala, in fact I also have a complex going up in the outskirts, IT knowledge is vital and there is a lot competition in every area of life. However despite my success as a business man, I am well aware that my well-being and that of this country depends on how sound our decisions will be today and in the future. Kaigo Betty is a Ugandan writer.